Although they are small, insects can cause big problems. 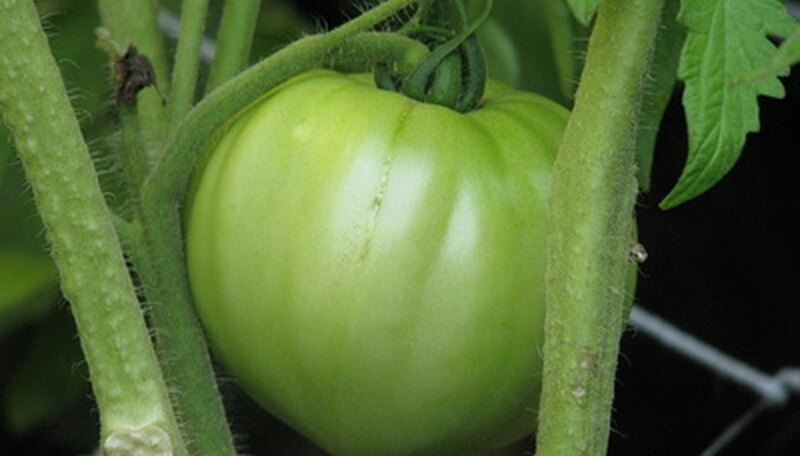 Damage can be as mild as discolored or misshapen leaves, but a severe infestation of cutworms, thrips or beetles can kill young tomato plants or render the ripening fruit on older plants inedible. To control insect populations on tomato plants, identify the pest and apply appropriate and safe insecticides. Used correctly, these products will protect your plants with minimal environmental impact. Botanical insecticides are derived from plants. Pyrethrum is derived from the chrysanthemum plant, is found in many over-the-counter pesticides and is effective against a broad range of garden pests. According to Cornell University, “Pyrethrum is quickly degraded in sunlight” and is “relatively non-toxic to humans.” Pyrethrum is, however, very toxic to fish. Rotenone, extracted from the derris plant, is highly toxic to fish but is labeled for use on food crops and degrades quickly in sunlight. It kills leaf-feeding pests like thrips and aphids. Sabadilla is extracted from the seeds of a lily plant. It is effective against caterpillars, thrips and stinkbugs. It is often combined with rotenone to increase its range of effectiveness. Neem-based insecticides act as growth regulators and are effective against moths, butterflies and their larvae. Bacillus thuringiensis (Bt) is a naturally occurring soil bacterium that is toxic to many species of insects including tomato hornworms and fruitworms. Bt compounds are safe for use around people, pets and wildlife. According to the Colorado State University Extension, "Bt proteins paralyze the digestive system, and the infected insect stops feeding within hours. Bt-affected insects generally die from starvation, which can take several days." Biological insecticides are best for mild infestations. Insecticidal soaps are used to control aphids, mealybugs, scale and whiteflies. It kills on contact for fast results but offers no residual killing power. Fatty acid soaps can be used on houseplants as well as tomato and other garden plants. Insecticidal soaps should be used with caution around beneficial insects like ladybugs and lacewings; this is a broad-spectrum insecticide and will harm certain species of desirable insects. Commercial insecticidal soaps are composed of potassium or ammonium salts of fatty acids. Plant- and fish-based insecticidal oils kill insects without harming plants, animals or the environment. They can be sprayed on tomato plants at any time during the growing cycle. Mixed with water and applied with a sprayer, these compounds are derived from soybeans, cottonseeds, canola, jojoba, neem seeds and fish. Synthetic insecticidal oils, derived from petroleum-based products, are available but very few are certified organic and should not be used on tomato plants or other food crops. Not all garden insects are bad. Enlist the help of beneficial insects in your fight against tomato pests. Ladybugs, lacewings, mantids and parasitic wasps are among the many willing consumers of aphids, mites and miscellaneous larvae and they are completely harmless to tomato plants and fruit. The original organic, non-toxic insect killers, beneficial insects in various stages of development are available in nurseries and garden centers.